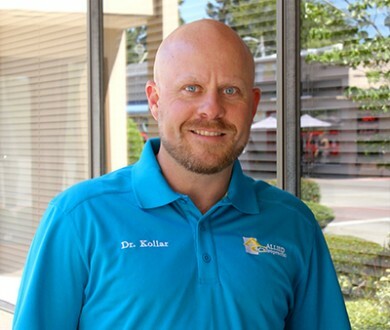 Dr. Dustin Kollar has been a practicing chiropractor for 18 years! Born in Scotland and raised in New York, he moved to Oregon and opened Allied Chiropractic in 2003. He enjoys providing the Hillsboro community with quality chiropractic care. Dr. Kollar specializes in auto injuries, family care, and major trauma. He has extensive post-graduate education and training in whiplash therapy. He decided to become a chiropractor after it personally experiencing its healing benefits for a sports injury in college. For Dr. Kollar, the most fulfilling part of his job is when a patient tells him they don’t know how they lived their life without his care. In his free time, Dr. Kollar loves spending time with his children, in particular watching them play baseball and softball. He also enjoys golf and traveling.